From how to actually spell the word, to learning how to properly pin one onto a suit, I’ve found that boutonnieres can often seem intimidating to many of my clients. Today, I’m going to walk you through 5 simple steps to teach you how to make and pin on these little floral accents! Once you have your greenery together, add your focal bloom. (This should be the largest flower). An example of a focal bloom could be a ranunculus, lisianthus or a spray rose. If you want a more whimsical/unique look, consider using a billy ball (“Craspedia” is the technical name!) or a small succulent. *Tip: you will need to wire a succulent to secure it as a boutonniere. This is a great video on how to wire a succulent! Next, add 1-2 accent blooms. These should be a little smaller than your focal bloom and/or a different color. Place one accent bloom higher/behind the focal bloom and the other bloom lower/in front or to the side of the focal bloom. Some examples of accent blooms could be spray rose, ranunuculus or lisianthus buds, thistle, mini carnations, etc. Lastly, add your filler flower to fill in any gaps between the other blooms. Filler flowers should be very small. Some examples of filler flowers are baby’s breath, wax flower, feverfew or berries such as hypericum or privet berries. The key with filler flowers is to not overdo it- less is more! Stem tape is vital to creating a secure boutonniere. You can purchase this kind of tape in the floral department at any craft supply store such as Michaels or Hobby Lobby. It is important to know that stem tape does not become sticky until you stretch it. Just give it a little tug on each end and that will be sufficient. Once you have stretched the tape, begin wrapping the stems together tightly. Next, it is time to choose a ribbon! I like using relatively narrow, satin ribbon like this. The kind in the link is semi sheer but I find it is actually a little easier to use full satin ribbon for better coverage. The goal is to cover up all the stem tape! If you prefer something a little fancier like hand-dyed silk ribbon, I love the variety of colors and sizes offered by Courtney Inghram, The Poetry of Silk and Tono & Co. These will be more expensive than what you’ll find at a general craft store, but they are beautiful, high quality ribbons. I always have space in my floral toolbox for my mini hot glue gun on event days. You never know when you’ll need to use it and the small size is perfect for travel and use on tiny details- like boutonnieres! You’ll just need a very small dollop of hot glue on the end of the ribbon to secure it together. Press on the area firmly for about 10 seconds and you will be good to go! With your right hand, start pushing the floral pin up from underneath the lapel flap. You should feel it go into the stems of the boutonniere. 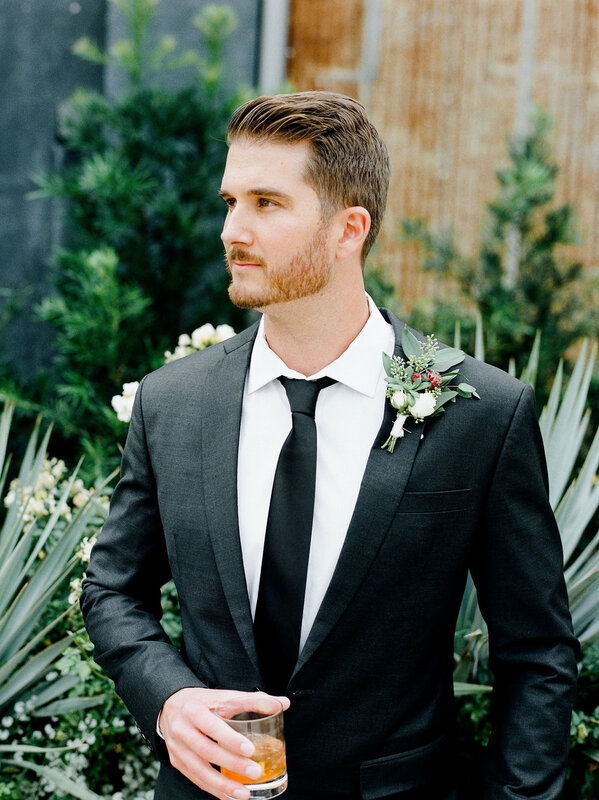 Once you can see the tip of the pin coming out from the other side of the boutonniere, push the tip back underneath the lapel to hide the metal part of the pin. That’s it! If you’ve found these steps helpful, I’d love for you to let me know by leaving me a comment below :) Teaching and sharing with others about flowers is one of my passions, and I’d love it if you’d join me one day soon for one of my upcoming floral arranging workshops. <— Click the link for more details and how to reserve your seat!